The Exclusionary Rule keeps police officers in check while conducting searches. It prevents prosecutors from presenting illegally obtained evidence. The rule states that any evidence siezed during an improper search cannot be used, no matter how incriminating it may be (see Fruit of the Poisonous Tree below). And, if this improper evidence the key piece to the entire case—the smoking gun—the prosecution may be forced to drop the case, sending a very guilty crook back on the street. The defendant may also have grounds for a civil suit against the officers involved, as well as the police department and the city. 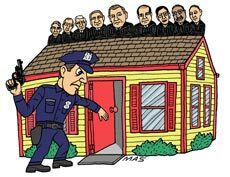 The Exclusionary Rule is basically the Supreme Court keeping watch over search-warrant-serving cops. When officers rely on a warrant that later turns out to be invalid. For example, officers search a house and find a large cache of illegal weapons along with a guy who’s in the process of grinding off serial numbers from an AK-47. Later, the court learns that the address on the warrant was incorrect because the detective accidentally typed River Avenue instead of River Road. Or, the landmarks used to identify the property to be searched were improperly recorded. The warrant may still be ruled valid and the seizure of the guns may still be legal. Or, the warrant may be ruled invalid but the seizure of the weapons could possibly stand. This is so because the officers were acting in good faith, believing they were on the property based on a constitutionally sound warrant (This is a weak example, but you get the idea). The Fifth Amendment to the U.S. Constitution guarantees us the right that no person shall “be subject for the same offense to be twice put in jeopardy of life or limb.” Actually, there’s more to it, but for the purpose of today’s post I’m focusing solely on the part—the Double Jeopardy clause—that protects us from the government trying us for the same crime twice. But does it actually do what those words indicate? Ordinarily, yes, the clause does indeed stave off overzealous prosecutors who cannot stand losing a case. Think about it for a moment. If defendants were not protected by The Constitution the government would have free reign to try cases over and over again until they reached the verdict they’d hoped to achieve. After all, it looks bad for government attorneys when they lose cases. A spotless win-win-win record is the brass ring in their world. The same, I suppose, is true for defense attorneys. After all, who’d hire the lawyer who never won a case? In the early 1920s, the Supreme Court allowed an exception the Double Jeopardy clause that permits state and federal prosecutors to bring separate charges for the same crime as long prosecutors are from separate sovereigns. I guess you can see where this is headed. Yep, the separate sovereigns rule absolutely allows consecutive prosecutions by both state and federal authorities— for crimes arising out of the same conduct. Yes, this exception to The 5th Amendment, the rule that “GUARANTEES” us the right to not be tried twice for the same offense, says’ “oh well, too bad, we’re doing it anyway” because the prosecutions are conducted by separate sovereigns. A great example of how this separate sovereign exemption works is a multi-jurisdictional narcotics task force operating under the umbrella of a federal agency, such as the DEA, FBI, or U.S. Marshalls. The federal agency is in charge and, of course, its agents have arrest powers throughout the U.S. Local officers who serve as members of the task force are sworn/deputized as Special Deputy Marshals, etc. Let’s refer to United States v. Davis as a good example, where officers and prosecutors failed to successfully win the case at the local level. Therefore, when the Greene County Court ruled to suppress the evidence because the court believed arresting officers/task force members did not have proper and reasonable/probable cause to stop the car operated by the defendants, the prosecutor moved to dismiss the charges and then referred the case to federal authorities so they could pursue the case. The defendants were then tried a second time for the same offense, only this time they were found guilty in a federal court. The overlapping of many local and federal laws (appr. 4,500 federal laws are now on the books) over the years has made it easy for federal agencies to prosecute even minor crimes such as the possession of small amounts of illegal drugs. This is not how the system was originally designed. Instead, state and local court were set up to handle local crime, not the feds who were supposed to focus on things such as terrorism, securities and tax law violations, weapons, interstate drug crimes, immigration, and civil rights violations. But now the feds have morphed into a huge conglomerate that overshadows local law enforcement, almost to the point of seemingly having to take on the smaller crimes simply to meet and justify their growing payroll. In 2008, Terance Gamble was convicted in an Alabama court of second-degree robbery, a felony. Convicted felons may not possess firearms. Therefore, seven years later when Gamble was stopped by officers who found illegal drugs along with a 9mm handgun in his vehicle, he was prosecuted under Alabama’s “felon-in-possession” statute. The conviction earned him one year in state prison. But Gamble’s troubles didn’t end there, because the U.S. attorney also charged Gamble with the same offense under federal law. A federal judge sentenced Gamble to 46 months in prison … for the same crime. Gamble appealed the “dual sovereignty” exception to the Double Jeopardy Clause, but, because of the exception per the Supreme Court ruling, the Appeals Courts had to ignore Gamble’s objection of being tried twice for the same crime. As a result, the ACLU and ACLU of Alabama, the Cato Institute, and the Constitutional Accountability Center“ filed an amicus brief urging the Supreme Court to look at the case with hopes of ending the dual sovereignty exception/loophole. On the opposite end of the Gamble spectrum is the state of New York. They’re fighting to add to/amend New York’s double jeopardy laws so their prosecutors can bring charges against people who receive presidential pardons. Having see first-hand how these cases come about and are tried, I’m anxious to see how all of this plays out. How about you? https://i2.wp.com/www.leelofland.com/wp-content/uploads/2018/10/two-two.jpg?fit=204%2C233&ssl=1 233 204 Lee Lofland https://www.leelofland.com/wp-content/uploads/2017/04/the-graveyard-shift-1.png Lee Lofland2018-10-11 10:43:182018-10-12 06:03:14Separate Sovereigns and Double Jeopardy: Constitutional, or Not? Are You Murdering Your Cop Stories? The writer, a lovely woman—Esther Neveredits—who shares her office with seven cats of various sizes and personalities, opened the first chapter of her first book with the following passage. “Detective Barney Catchemall followed the killer, a man named Folsom Blue, across seven states and forty-eight jurisdictions, shot him in the arm with two rounds fired from his department-issued semi-automatic revolver, and then brought him back to the city where he’ll stand trial before the Grand Jury on a charge of Homicide 1. So, did Ms. Neveredits have her facts straight? Yes? No? Fortunately, and unlike Esther (bless her heart), most writers are pretty savvy when it comes to writing about cops and criminals and everything in between. And those who have questions … well, they typically ask an expert to help with the details. Or, they attend the Writers’ Police Academy where they’ll receive actual police training—driving, shooting, door-kicking, investigate crimes, and so much more, and it’s all designed for writers. But let’s return to Esther’s paragraph. What did she get wrong? The better question is how many things did she get wrong and in so few words? Is there an official charge of Homicide I? Are police officers permitted to cross jurisdictional boundaries, shoot a suspect, and then bring them back to stand charges? Do Grand Juries try criminal cases? Can a defendant be tried twice for the same crime? Can a prosecutor continue to bring charges against someone over and over again until they get the results they seek—a conviction? Semi-auto revolver? Is there such thing as a semi-auto revolver? What the heck is a badge bunny? It is Murder that’s the unlawful killing of another person. The crime is usually deliberate or committed during an act that showed total disregard for the safety of others. “I understand that murder is a crime,” you say, but … what’s the difference between murder and homicide? Don’t they share the same meaning? Is there a difference? Yes, of course there’s a distinction between the two, and the things that set them apart are extremely important. Again, murder is the unlawful killing of a person, especially with malice aforethought. The definition of homicide encompasses ALL killings of human beings by other humans. And certain homicides are absolutely legal. Anyway, yes, some homicides are indeed, L.E.G.A.L., legal. Another term/crime you should know is felony murder. Some of you attended a popular and detailed workshop about this very topic at the Writers’ Police Academy. To get everyone’s attention, a bank robber fires his weapon at the ceiling. A stray bullet hits a customer and she dies as a result of her injury. The robber has committed felony murder, a killing, however unintentional, that occurred during the commission of a felony. The shooter’s accomplices could also be charged with the murder even if they were not in possession of a weapon or took no part in the death of the victim. Also, Manslaughter – Even though a victim dies as a result of an act committed by someone else, the death occurred without evil intent. While attending a mind-numbing car race where drivers made loop after loop after loop around an oval dirt track, a quite intoxicated and shirtless Ronnie Redneck got into a rather heated argument with his best buddy, Donnie Weakguy. During the exchange of words, Weakguy begins yelling obscenities and with the delivery of each four-letter word he jabbed a bony index finger into Redneck’s chest. Redneck , a man of little patience, took offense at the finger-poking and used both hands to shove Weakguy out of his personal space. Well, Weakguy, who was known countywide for his two left feet, tripped over his unconscious and extremely intoxicated girlfriend, Rita Sue Jenkins-Ledbetter, and hit his head on a nearby case of Budweiser. He immediately lost consciousness and, unfortunately, died on the way to the hospital as a result of bleeding inside the skull. Weakguy’s death was not intentional, but Ronnie Redneck finds himself facing manslaughter charges. Jurisdiction – A law enforcement agency’s geographical area where they have the power and authority to enforce the law. Grand Jury – A panel of citizens selected to decide whether or not probable cause exists to charge a defendant with a crime. The Grand Jury hears only the prosecution’s side of the story. The defense is not allowed to present any evidence. In fact, the defense is not allowed to hear the testimony offered by the prosecution. Asset Forfeiture – The government is allowed to seize property used in the commission of a crime. Many police departments benefit from the forfeiture of items such as, cash, cars, homes, boats, airplanes, and weapons. These items may be sold at auction, or used by the police. For example, drug dealers use a 2010 Mercedes when making their deliveries. Police stop the car and arrest the occupants for distribution of heroin. Officers of a joint task force seize the car and subsequently fill out the proper asset-forfeiture paperwork. The vehicle is later forfeited (by the court) to the police department’s drug task force. They, in turn, assign the vehicle to their drug task force where officers use it as an undercover car. Other assets (fruits of the illegal activity) are also seized and sold and the proceeds are divided among the agencies who participated in the bust and prosecution—prosecutor’s office, local police departments with officers assigned to the task force, etc. “You have the right to remain silent and I have the right to take whatever I want,” said The Government. Double jeopardy – The Fifth Amendment rule stating that a person cannot be made to stand trial twice for the same offense. Badge Bunny – A woman or man who is over-the-top romantically interested in police officers and firefighters, and pursues them relentlessly. And I do mean REE-Lentlessly. They sometimes follow officers around while they’re on duty. The eat in the same restaurants. Watch officers from afar. Bring baked goods to the police department. Call in false reports that bring officers to their homes. Stand or park nearby the police department during shift changes. Make friends with dispatchers, hoping they’ll help get them closer to the officers who make their stalking hearts go pitter-patter. They drive fast, hoping an officer will stop them for speeding, an opportunity to flirt. And, well, you get the idea. REE-Lentless. * Badge Bunnies have been assigned a variety of nicknames by officers, such as beat wives, holster sniffers, and lint (because they cling to uniforms). Here’s a easy rule of thumb to remember that’ll help to sort out the murder/homicide issue. All murders are homicides, but not all homicides are murder. See, I told you the only things consistent in police work are the inconsistencies therein. And that’s a fact … maybe. https://i0.wp.com/www.leelofland.com/wp-content/uploads/2018/04/cow-dbl-jeopardy-copy-2.jpg?fit=630%2C365&ssl=1 365 630 Lee Lofland https://www.leelofland.com/wp-content/uploads/2017/04/the-graveyard-shift-1.png Lee Lofland2018-04-26 13:29:082018-04-26 13:29:08Are You Murdering Your Cop Stories? Buying Justice: Myth Or Reality? Who stands a better chance of walking out of a courtroom free and clear of all criminal charges? Is it the rich businessman and his team of high-priced attorneys? Or, is it the average Joe, a hardworking ditch-digger who barely gets by earning minimum wage and is represented by an overworked, underpaid court-appointed attorney who’s fresh out of law school? I think it’s safe to say the answer to that question is, well … it goes without saying. I’m sure you’ve all heard of the latest high-profile case where a young man of more than substantial means, while driving drunk, crashed and killed four people. His family hired a couple of “big name” attorneys, and when the dust settled the defendant skated out of the courtroom with a sentence of probation. His defense had been that he was raised in the midst of extreme wealth and riches and had never been disciplined for doing wrong. As a result of living in those “horrible” conditions he suffered from affluenza, meaning that he couldn’t/didn’t know any better. Apparently, affluenza renders some folks totally and utterly stupid beyond all definitions of the word. At least, though, the young man’s attorneys managed to come up with a defense that has a name attached to it. But what about the wealthy one-percenters who never seem to serve any real time for their crimes? How do they manage to avoid the orange jump suits and sharing a 6×9 concrete and steel room with roaches and rats? Has it always been this way, where the well-connected enjoy a different standard of justice than do folks of meager means? Let’s begin our exploration on a small scale—the wannabe big fish in a tiny pond. You know, the upper crust of small town U.S.A. There was a deputy who’d decided to come in off patrol to catch up on a bit of paperwork. He parked in front of the jail and, after that unseen person buzzed him through the gates, he headed upstairs to a private office area where several deputies shared a bank of desks and a few typewriters. As he made his way up the steps he heard someone clacking away at one of the old Royals. He thought it was odd to hear someone hard at work in the office because he hadn’t seen any other patrol cars parked outside. When he turned the doorknob and pushed the door open, he was quite surprised to see a young man, a non-employee civilian, sitting behind one of the army-green metal desks. The stranger looked up from his typing and, without so much as a “kiss my tail feathers,” he went back to pecking the keys. To top off the bizarre situation, a tiny fluffy dog that resembled a small sheep was seated in his lap, licking the remnants of a bright red lollipop. The interloper stopped typing and looked up. He was obviously irritated that the lowly deputy had the gall to bother him. The deputy continued. “Did someone give you permission to be in here?” The deputy was concerned because their lockers, which contained evidence, firearms, chemical sprays, and other police goodies, were also in the room. The little snob said, “Yeah … they did.” He went back to work. “Who, what?” was the kid’s snotty reply to him, without bothering to stop punching the keys and dinging the bell. Well, after checking his story it turned out that Mr. Typewriter was indeed the high-court judge’s son, and the little darlin’ had been convicted of manslaughter in another jurisdiction (driving drunk and crashed into a car, killing the elderly couple inside). His father, the judge, pulled some strings and arranged it so that his baby boy—a grown man attending college—could serve his sentence in this particular jail. The judge had also worked a deal with the sheriff to allow the kid to remain outside of the cell blocks until lights out. He was also to be allowed to hang out in the employee break room, watch TV, enjoy meals delivered to him from the outside, wear street clothes, and to use the desks and typewriters normally reserved for deputies to complete his papers and other projects for the college he attended (assignments and notes were also delivered to him). Deputies were not to disturb the judge’s son while he was using their typewriters and their desks. In another instance, a wealthy businessman was arrested for his 4th DUI and was subsequently sentenced to a whopping 30 days in the county jail. This man was one of the county sheriff’s golfing and drinking buddies. You can imagine how this went. During his “incarceration,” the man was allowed to wear his street clothes. He was also allowed to wear a gold bracelet, watch, and a gold chain around his neck that was nearly large enough to use as an anchor chain on a battleship. Jailers were instructed that this man’s cell door was to remain unlocked and open at all times. Jail cooks were mandated to prepare made-to-order meals for him (he sent his selections to the kitchen via the on-duty jailers). He received a daily newspaper. He used the phone anytime day or night. He received visitors anytime day or night. He was allowed to run his business from the jail. He roamed the halls and corridors normally patrolled by jail staff. And, he was even allowed to use the jail conference room for business meetings! A first time offender was arrested by an FBI agent for possessing less than $100 worth of crack cocaine. Thousands upon thousands upon thousands of dollars were poured into the investigation—search warrants, canines, dozens of officers, agents, state police, prosecution team, etc. All for less than $100 worth of crack cocaine. That’s it. That’s all they found and that was the defendant’s only charge. The FBI and federal prosecutors threatened to lock up the man’s family (as accomplices: they weren’t). Officials threatened the man with a sentence of 10 years or more. And they threatened to seize his home and all of his possessions, leaving his family with absolutely nothing. However, the officials offered a five year sentence if the man pleaded guilty. The defendant hired a very prominent attorney to represent him … for a base fee of $25,000. Shortly after, the attorney came to the man (who was in jail under NO BOND) and said the plea deal he’d negotiated was for just over three years in federal prison. The attorney, by the way, placed a lien on his client’s home for the $25,000, and he’d done so the moment he was retained. The defendant had no access to any funds other than the equity in his home. The attorney, in the same conversation, said he could probably have the sentence reduced to probation or home confinement if the defendant could somehow find another $25,000. So, what are your thoughts? Is there a special justice system for the wealthy “one-percenters”? Are harsher sentences handed down to the average Joe’s and Jane’s in this country? How about the poor? Do they stand a chance against the courts and powerful prosecutors? Do some prosecutors, such as U.S. Attorneys, routinely step on the “little people,” chalking up big conviction numbers to further their personal career goals—like an appointment as the head of the FBI, etc.? Can money truly buy freedom? Sadly, I think I’ve seen enough over the years to say yes, in some cases it can. https://i1.wp.com/www.leelofland.com/wp-content/uploads/2014/02/20170516_092208-copy.jpg?fit=800%2C600&ssl=1 600 800 Lee Lofland https://www.leelofland.com/wp-content/uploads/2017/04/the-graveyard-shift-1.png Lee Lofland2017-05-16 08:50:352017-05-18 14:23:09Buying Justice: Myth Or Reality? Marilyn Mosby is the Maryland prosecutor who elected to prosecute the six officers involved in a case that resulted in the death of Freddie gray, a suspect who was in their custody at the time of his unfortunate demise. Mosby failed to receive a conviction in either of the first four cases and on Monday, dropped the remaining charges against the rest of the officers awaiting trial. Mosby, obviously frustrated because the officers chose to have their cases heard by a judge rather than a jury, said she wants to pursue greater prosecutorial power over whether a defendant can choose a bench trial over a jury trial. In short, she wants this particular and extremely important right taken away from all defendants, further stacking the deck against them as they face incarceration and other punishments that include the loss of even more rights. One of the purposes of affording the option of trial type is to allow a defendant to have his/her case heard by a judge rather than a jury whose opinions may be swayed by emotions and public statements made prior to start of the courtroom proceedings. A great example of possible jury tainting is the case in question, the trials of the officers accused of murdering Freddie Gray. Many have considered Mosby’s dramatic speech as a one offered by an angry political activist rather than that of a unbiased prosecutor. Potential jurors likely witnessed her appearances on national TV, in magazines, and on the stage with Prince at a concert that was billed as a Rally4Peace, an event in honor of Freddie Gray, the victim in the case. Not to mention that she’s married to City Councilman Nick Mosby, whose district includes the area where the Gray incident and much of the recent Baltimore rioting took place. She’s also friends with Gray family lawyer Billy Murphy. Murphy helped with Mosby’s campaign fund-raising. So yes, the defendants in the case had just cause to fear the jury pool would be stacked against them. Therefore, as is their right, they opted to have their cases heard by a judge, an option Mosby wants to change. I’ve included the below text, especially for Maryland prosecutor Marilyn Mosby, in the event this page is missing from the law books in her office. Please note the red text below. Seriously (I suppose Ms. Mosby is at least aware of the law), I highlighted the line in red so to make it stand out to help those who aren’t aware that this indeed is the law. The right to trial by judge, or jury, is not a suggestion or something that can be instantly altered simply because someone doesn’t like it, or because the results produced by it are not favorable to an attorney involved in a court proceeding. (a) Generally. In the circuit court, a defendant having a right to trial by jury shall be tried by a jury unless the right is waived pursuant to section (b) of this Rule. The State does not have the right to elect a trial by jury. (b) Procedure for Acceptance of Waiver. A defendant may waive the right to a trial by jury at any time before the commencement of trial. The court may not accept the waiver until, after an examination of the defendant on the record in open court conducted by the court, the State’s Attorney, the attorney for the defendant, or any combination thereof, the court determines and announces on the record that the waiver is made knowingly and voluntarily. Committee note: Although the law does not require the court to use a specific form of inquiry in determining whether a defendant’s waiver of a jury trial is knowing and voluntary, the record must demonstrate an intentional relinquishment of a known right. What questions must be asked will depend upon the facts and circumstances of the particular case. In determining whether a waiver is knowing, the court should seek to ensure that the defendant understands that: (1) the defendant has the right to a trial by jury; (2) unless the defendant waives a trial by jury, the case will be tried by a jury; (3) a jury consists of 12 individuals who reside in the county where the court is sitting, selected at random from a list that includes registered voters, licensed drivers, and holders of identification cards issued by the Motor Vehicle Administration, seated as jurors at the conclusion of a selection process in which the defendant, the defendant’s attorney, and the State participate; (4) all 12 jurors must agree on whether the defendant is guilty or not guilty and may only convict upon proof beyond a reasonable doubt; (5) if the jury is unable to reach a unanimous decision, a mistrial will be declared and the State will then have the option of retrying the defendant; and (6) if the defendant waives a jury trial, the court will not permit the defendant to change the election unless the court finds good cause to permit the change. In determining whether a waiver is voluntary, the court should consider the defendant’s responses to questions such as: (1) Are you making this decision of your own free will? (2) Has anyone offered or promised you anything in exchange for giving up your right to a jury trial? (3) Has anyone threatened or coerced you in any way regarding your decision? and (4) Are you presently under the influence of any medications, drugs, or alcohol? Cross reference: See Kang v. State, 393 Md. 97 (2006) and Abeokuto v. State, 391 Md. 289 (2006). (c) Withdrawal of a Waiver. After accepting a waiver of jury trial, the court may permit the defendant to withdraw the waiver only on motion made before trial and for good cause shown. In determining whether to allow a withdrawal of the waiver, the court may consider the extent, if any, to which trial would be delayed by the withdrawal. Source: This Rule is derived from former Rule 735. *As always, please … no arguments about gun control, police-bashing, protestors, political rants and raves, bashing of political candidates, religion, race, and, well, the usual. Oh, and please do save the bad language for other pages. We have kids who visit this page and I’d like to keep the site as kid-friendly as possible. Besides, I’m extremely weary of seeing and hearing the “F” word. But that’s just me. Thanks! Well, it actually happened. I’ve lived long enough to say I’ve seen it all when it comes to our government controlling what people may or may not do and say. The federal muzzling, if the plan moves forward, and we all know it will if they want it to, includes what experts are allowed to say when testifying in court. Or, more importantly, what they’re not permitted to say during those legal proceedings. The Department of Justice recently spent a ton of time and resources to draft a guidance regarding courtroom testimony of government experts, such as those folks employed by the three-letter agencies—FBI, etc. At first glance, this sounds a bit over the top and perhaps a trampling of free speech. However, when it comes to sending innocent people to prison based on the mere opinion, not scientific proof, of a technician in the employ of a law enforcement agency, well, this idea may not be such a bad thing after all. Remember, when experts exaggerated the fortitude of hair and bite mark evidence? It was, after all, their testimony that, for decades, led to the convictions and imprisonment of several people who were later exonerated and released. Ray Krone was exonerated after spending 10 1/2 years in prison. Three of those years were served on death row. Ray’s conviction was based on faulty bite-mark evidence. Click the link to read more about Ray’s incredible story. Here are only a few of the new DOJ proposed guidelines…the things experts may NOT say when testifying in criminal and civil proceedings. state the dose of a drug or poison based on analytical findings in post-mortem samples. state an opinion that an individual was impaired based on a drug concentration in a urine or hair sample. state or imply that the methods used in performing serological examinations have error rates of zero or that they are infallible. state or imply that two friction ridge prints originated from the same source to the absolute exclusion of all other sources. state that a shoe/tire is the source of a questioned impression to the exclusion of all other shoes/tires because all other shoes/tires have not been examined. state or imply that a fiber came from a particular source to the exclusion of all other sources. Remember, this is only a small sampling of the things experts may NOT say in court. Believe me, the list is long and there are more on the way. This sort of makes one wonder if, in the future, there’ll be a need to call experts to the stand. What do you think? Should experts be allowed to offer their opinions based on scientific findings, even if it means an innocent person, such as Ray Krone, could wind up on death row? Should you wish to express your views about these proposed guidelines, you may do so directly to the Department of Justice by clicking HERE. Plea Bargains: Voluntary, or Legal Coercion? The Sixth Amendment guarantees that “in all criminal prosecutions, the accused shall enjoy the right to a speedy and public trial, by an impartial jury.” The Constitution further guarantees that the accused will have the assistance of counsel and may be convicted only if an impartial jury of his peers unanimously determines that he is guilty beyond a reasonable doubt. So what about plea bargains? There’s no judge or jury involved in that process. Instead, a plea agreement is reached when both the prosecutor and defense sit down and hammer out a really good deal for both sides, right? Well, not quite. A plea bargain is about as one-sided as it gets, and the side that wins nearly every single time is that of the prosecution. In fact, less than 3% of all federal criminal cases make it to trial. This translates into a whopping 97% of all federal cases being decided by a plea bargain. And, it is the prosecutor who decides how much time the defendant will serve behind bars, not a judge or jury of anyone’s peers. The defense is at a huge disadvantage at the onset of the process because prosecutors hold all the cards—secret grand jury testimony and evidence, crime scene evidence and lab test results, witness statements, and the authority to charge the accused with the most severe offense he believes he can prove…UNLESS the defendant agrees to plead GUILTY in exchange for a charge of a lessor offense, which would result in serving far less time in prison than had he been found guilty of the more severe charge. In many, if not most cases, “far less time” could be a decade or even more. The way a federal plea bargain works, in short, is like this. 1. Police conduct an investigation and hand over their collected information and evidence to a prosecutor. 2. The prosecutor presents his/her case to the Grand Jury who almost always issues a “true bill,” meaning there is enough evidence/probable cause to proceed with the trial. After all, the only people testifying before them are witnesses for the prosecution. The defense is not a part of the Grand Jury process. 3. The suspect is arrested and incarcerated. A favorite prosecution trick is to have agents/officers make the arrest on a Friday afternoon. This is so the suspect will have to sit in jail throughout the entire weekend, until judges/magistrates return to the bench on the following Monday to hold/conduct a bond hearing (holiday weekends are a bonus because courts are also closed on Mondays). This provides the defendant a bit of eye-opening time behind bars before having an attorney appointed to their case. When Monday morning finally rolls around, many defendants are willing to do or say almost anything to return home, including agreeing to a quick plea deal. 4. Bond is either set or denied. 5. Prosecutor and defense attorney meet either in person or by phone. 6. Prosecutor offers a deal—a lessor charge if the defendant agrees to plead guilty, or face the top charge possible, along with the standard obstruction of justice for not accepting responsibility (not pleading guilty) with as much time in prison as the law allows. Obstruction, by the way, could result in an additional sentence of ten years. And that’s on top of the time for the original charge. 7. Defense attorney presents the “deal” to his client—either plead guilty to the lessor charge and serve time in federal prison for ONLY three years, for example, or refuse the deal and face the possibility of being found guilty anyway, but receive a sentence of twenty years in prison. And, this deal is open for discussion only at that moment. There’s very little time given to consider it. It’s either now or never in most cases. Of course, prosecutors will most likely accept a deal at a later time to avoid taking the case to trial, but the first offer is always the best offer. The longer the wait the more time the defendant will have to serve in prison. 8. The deal is almost always accepted. As I stated earlier, this is so in approximately 97% of all federal criminal cases, including deal acceptance by defendants who are innocent of the crimes for which they’re charged. These folks plead guilty because they’d rather agree to a shorter time in prison rather than face decades behind bars, or, in some cases, the possibility of receiving the death penalty…for a crime they didn’t commit. In 2012, the average sentence for drug offenders (in federal court) who agreed to plea deals was five years and four months. Defendants who rolled the dice and went to trial were sentenced to an average of sixteen years. It’s a “no-brainer” decision and prosecutors know it and they rely on it. And, a plea deal typically includes a “no appeal” stipulation. A fair and voluntary system? What do you think? Before you answer, consider this. Of the 2.2 million people in American prisons, over 2 million of those individuals are there as a result of a plea bargain devised by a prosecutor who also determined the amount of time the defendant was to serve behind bars. No jury. No judge. All prosecutor. Some have said “having our day in court” is a thing of the past. What about you? Do you agree with the current method of plea bargaining? https://i2.wp.com/www.leelofland.com/wp-content/uploads/2012/11/P1010212.jpg?fit=448%2C336&ssl=1 336 448 Lee Lofland https://www.leelofland.com/wp-content/uploads/2017/04/the-graveyard-shift-1.png Lee Lofland2015-07-10 11:48:332017-05-23 14:35:41Plea Bargains: Voluntary, or Legal Coercion? As a sitting judge on a general trial court for twenty years, I ran across many things that made me wonder if anyone knew anything about the law. There is, of course, no secret that lawyers and their co-conspirators in all levels of government work daily and diligently to make the law incomprehensible. (CPAs are also guilty, but that’s another blog post.) So if we lawyers make things difficult, we shouldn’t complain when people don’t understand it, right? Wrong. Here are but three of many things that make me growl. If you are married and you do not want to be married, the only legal way I know of to accomplish that is to file a lawsuit asking the court to unhitch you. You must file a petition (or complaint or whatever your state calls it) and the court that hears divorce cases. That makes you the plaintiff (or petitioner or whatever your state calls it). The other party to the lawsuit (your soon to be ex-spouse) is called the defendant (or respondent or whatever your state calls it). In some states, if you’ve agreed on everything, you can file a notice of settlement and some judge will sign a judgment, declaring you and your sweetie to no longer be married. If you can’t agree, there could be a knock-down, drag-out courtroom battle that concerns everything from child custody to who gets the matched salt-and-pepper shakers from Hawaii. That, my friends, is a real lawsuit, the same as if it was Standard Oil and the EPA. When you die, there are two ways your stuff (if you have any stuff leftover from paying taxes all your life) is split one of two ways: You have a will or the government decides where your stuff goes. This one I shouldn’t get too upset about because of the growing prevalence of trusts and other non-probate transfers of property. Such things keep you away from the probate division of the court to some degree or the other (depending on your state). Free legal advice: Go to a competent—meaning you’ve done your research on the person—estate planning lawyer. Get a financial power of attorney, a healthcare power of attorney, a will, a trust, and advice on how transfer/pay on death works in your state. This can save you a lot of money and heartache. If you don’t care where your stuff goes and you don’t care if you have heartache and grief, then don’t do anything or use forms you found on the Internet. And there’s no “reading of the will” except on soap operas. In fact, after you make out all your estate-planning documents, you should give photocopies to your potential heirs—you don’t have heirs until you die—and make sure they know how to get to your safe place after you pass. Protect your valuable documents from fire, flood, wind, earthquake, and critters (four- and two-legged). BAIL is generally how much the judge wants before you get out of jail and BOND is generally how the bail is made. Don’t ever expect journalists to get this right. And judges and lawyers often confuse it also. The best way to knock this one flat is to give you three scenarios. ONE: Danny Defendant has been arrested for a felony and the judge says, “You’ve always shown up in the past when you’ve been arrested so I’ll let you out on your own recognizance and we’ll take your word for it that you’ll be back for your trial.” This is a recognizance bond (or signature bond or whatever your state calls it). TWO: Danny Defendant has been arrested for a felony and the judge says, “$10,000 cash only bail.” Danny’s decrepit grandmother who barely scrapes by on Social Security, sells her great-grandmother’s diamond ring and forks over $10,000 in cash to the court and gets a receipt made in Danny Defendant’s name. When he shows up, she gets the dough back. If he doesn’t show up, the government keeps the money. This is cash bond (or whatever your state calls it). THREE: Danny Defendant has been arrested for a felony and the judge says, “$10,000 bail.” Chico leaves the Little League game he’s sponsoring and hustles down to the jail. Chico sells Danny a bail bond for $1000 which is paid for by Danny’s decrepit grandmother who gets a receipt made out in Danny’s name. If Danny shows up when the court tells him to, then the bond is cancelled. If Danny does not show up when the court tells him to, the bond is forfeited and Chico sues the decrepit Grandma for all she’s worth since Danny is gone. This is a bail bond (or whatever your state calls it). After two decades on the bench, Bill Hopkins captures readers with his Judge Rosswell Carew murder mysteries. How does a judge manage to wrangle his way into investigating so many crimes? And can he do it without crossing into the dark side himself? Find out by reading the complete series beginning with Courting Murder, followed by River Mourn and Bloody Earth. Bill Hopkins is retired after beginning his legal career in 1971 and serving as a private attorney, prosecuting attorney, an administrative law judge, and a trial court judge, all in Missouri. His poems, short stories, and non-fiction have appeared in many different publications. He’s had several short plays produced. A book of collected poetry, Moving Into Forever, is available on Amazon. Bill is a member of Mystery Writers of America, Dramatists Guild, Horror Writers Association, Missouri Writers Guild, Romance Writers of America, and Sisters In Crime. Bill is also a photographer who has sold work in the United States, Canada, and Europe. He and his wife, Sharon (also a published writer), live in Marble Hill, Missouri, with their dogs and cats. Besides writing, Bill and Sharon are involved in collecting and restoring Camaros. You’ve all seen the deputies and other officers who guard courtrooms. Yes, they’re highly visible and they’re there to protect everyone from harm. However, courtroom security is far more than just watching prisoners inside the actual room where the trial is held. Courtroom security officers diligently monitor spectators, witnesses, and defendants. They also watch the victim’s family members for any signs of potential violence against the defendant(s). And they’re always on high alert for escape attempts by prisoners. But what we see in the courtroom—stern faces, sharply creased uniforms, and holstered weapons—is the tip of the iceberg. Behind the solid oak door at the rear of the courtroom is a well-oiled security machine with wheels that begin to turn long before the judge, jury, and witnesses sit down to have their breakfasts. In fact, many security measures have been in place for months, maybe years. Security starts with things like landscaping around the building and parking areas. Plantings and hardscapes must allow an unobstructed view and no potential hiding spots for snipers and others who may assist in an escape attempt during times of inmate and witness movement. Outdoor lighting must be adequate, and prevent areas of darkness and shadow. Those yellow posts sticking up through the sidewalks and pavement? They’re in place to prevent a driver from rushing the building, or people. The barriers also prevent vehicles (those containing explosives, getaway vehicles, shooters, etc.) from getting too close to the facility. Windows and doors are equipped with a shatter resistant film between the layers of glass. As a means of even greater protection some lower floor windows may be fitted with bullet-resistant glass. Doors are tamper proof and are connected to alarm systems. Visitors to the courthouse, and their belongings, are carefully screened prior to entering secured areas of the facility. Officer stationed at x-ray machine and walk-through metal detector. Many judges have panic buttons hidden somewhere on their benches. A quick press of the button and the alarm sounds in manned stations within the courthouse and in nearby police departments. Help is on the way in an instant. Designated parking areas for judges and other court employees is a standard. The same is true for police and inmate transport vehicles. Any unauthorized vehicle in those areas is cause for concern and would require immediate investigation. To further prevent breaches of security, the public is not permitted in any unauthorized areas of the court buildings. Courthouses also feature secure areas for weapons and other sensitive material. Inmates are awakened, fed, and dressed long before the courtroom is open. All prisoners with hearings on a given day are transported from the county or city jail to the courthouse, where it’s quite possible they’ll each remain until the last trial of the day. While at the courthouse prisoners must receive meals, bathroom facilities, etc. for the duration of their time there, which could be many, many hours. Holding cells, where prisoners wait until the time of their trial, are located inside court buildings. After their time in the courtroom is complete, prisoners are returned to the holding cells where they remain until they’re transported back to the main jail, often at the end of the day when all inmates are transported at once. *It is possible that transportation officers make trips to and from the jail and courthouse throughout the day. This depends on availability of staff members and vehicles. Remember, the fewer times inmates are out and about in the public, even in secured transport vehicles, reduces the opportunities for escape. Inmate movement inside the courthouse is conducted through special hallways or passageways that are typically not available to the public. FYI – Some courthouses are directly connected to jail facilities via underground/basement hallways. In most areas, the duty of courtroom security falls on the sheriff of that particular jurisdiction. The sheriff assigns deputies to each courtroom, and each of those deputies receive specialized training that’s specific to the courtroom and inmate transportation. In the federal system the job of courtroom and inmate security falls on the shoulders of the U.S. Marshals. Transporting prisoners via the U.S. Marshals’ Justice Prisoner and Alien Transportation System (JPATS). JPATS operates a network of aircraft, cars, vans and buses. (U.S. Marshals photo). Protecting our courtrooms, and shuttling prisoners to and from those facilities, is a tough and dangerous job, a job with duties many people never see.